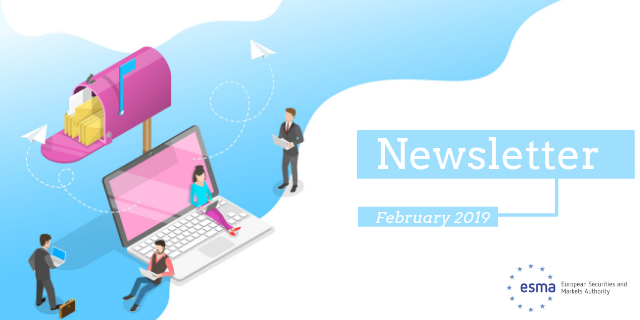 In this first edition of ESMA's new newsletter we catch up on the full list of publications and announcements following ESMA's Board of Supervisors meetings on 18 December 2018 and 30 January 2019. We also look forward to the month ahead with details of speaking appearances by ESMA staff, consultation deadlines and key dates for your agenda. The hearing is fully booked but will also be broadcast live on Twitter and will be recorded. ESMA will publish a full video of the hearing in the days following the event. Missed any ESMA publications? Check out the full list of news items from our press office. On 23 January 2019, ESMA adopted a Decision under Article 40 of Regulation (EU) No 600/20141 to restrict the marketing, distribution or sale of contracts for differences (CFDs) to retail clients. ESMA) has issued three Questions and Answers (Q&As) regarding the Prospectus Directive (PD) and the Transparency Directive (TD). ESMA has published an update of its action plan (within its updated Q&As on MiFID II and MiFIR transparency topics) for the systematic internaliser (SI) regime calculations ahead of the next schedule publication on 1 February 2019. ESMA has updated its Questions and Answers regarding the implementation of the Central Securities Depository Regulation (CSDR). The Board of Supervisors of the ESMA has appointed the following individual to serve as chair of its Investment Management Standing Committee (IMSC): Gabriela Figueiredo Dias, Chair of the Comissão do Mercado de Valores Mobiliários (CMVM) of Portugal. ESMA has published the responses received to its Call for evidence on periodic auctions for equity instruments. ESMA has published today its annual report on the application of accepted market practices (AMP) in accordance with the Market Abuse Regulation (MAR). European Supervisory Authorities (ESAs) approved on 10 January 2019 the content of the Multilateral Agreement on the practical modalities for exchange of information between the ECB and all competent authorities (CAs) responsible for supervising compliance of credit and financial institutions with anti-money laundering and countering the financing of terrorism (AML/CFT) obligations under the fourth Anti-Money Laundering Directive (AMLD4). ESMA published its Advice to the European Union (EU) Institutions – Commission, Council and Parliament – on initial coin offerings and crypto-assets. ESMA IS SEEKING CORPORATE REPORTING EXPERTS FOR STAKEHOLDER PANEL ESMA has issued today a call for candidates in order to renew the composition of its Consultative Working Group (CWG) which advises ESMA’s Corporate Reporting Standing Committee (CRSC). ESMA has updated its public register with the latest set of double volume cap (DVC) data under the Markets in Financial Instruments Directive (MiFID II). ESMA has issued its final Regulatory Technical Standards (RTS) regarding cooperation between competent authorities (CAs) and the European Supervisory Authorities (ESAs) under Regulation (EU) 2017/2402 (the Securitisation Regulation). The European Supervisory Authorities (ESAs) published a joint report on innovation facilitators (regulatory sandboxes and innovation hubs). ESMA has updated its Q&As on MiFID II and MiFIR commodity derivatives topics. ESMA has updated its Q&As regarding transparency issues under the Market in Financial Instruments Directive (MiFID II) and Regulation (MiFIR). ESMA adopted a Decision under Article 40 of Regulation (EU) No 600/2014 to renew the prohibition on the marketing, distribution or sale of binary options to retail clients. ESMA has published amended guidelines on the application of C6 and C7 of Annex 1 of MiFID II. ESMA has provided an update on its assessment of third-country trading venues (TCTVs) for the purpose of post-trade transparency and position limits under MiFID II/MIFIR. ESMA has published its final report on guidelines on non-significant benchmarks under the Benchmarks Regulation (BMR). ESMA has withdrawn the credit rating agency (CRA) registrations of S&P Global Ratings France and S&P Global Ratings Italy following the merger with S&P Global Ratings Europe, based in Ireland. ESMA has agreed to renew the restriction on the marketing, distribution or sale of contracts for differences (CFDs) to retail clients, in effect since 1 August, from 1 February 2019 for a further three-month period. ESMA has published a Public Statement to clarify its plans for the recognition of Central Counterparties established in the United Kingdom (UK CCPs) as Third Country CCPs (TC-CCPs) under Regulation (EU) No 648/2012 (EMIR) for a no-deal Brexit scenario. ESMA issued a statement to remind firms, providing investment services, of their obligations to provide clients with information on the implications of the UK's withdrawal from the EU on their relationship with clients and on the impact of Brexit-related measures that a firm has taken or intends to take. 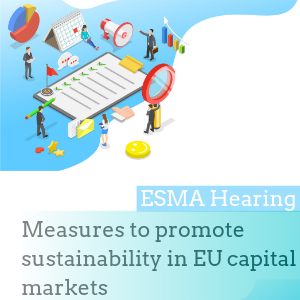 ESMA has launched three public consultations on sustainable finance initiatives to support the European Commission’s (EC) Sustainability Action Plan in the areas of securities trading, investment funds and credit rating agencies (CRAs). ESMA has updated its Questions and Answers on the Benchmarks Regulation (BMR). ESMA has updated its Questions and Answers on the Credit Rating Agencies Regulation (CRAR). The European Supervisory Authorities (ESAs) published two joint draft Regulatory Technical Standards (RTS) to amend the RTS on the clearing obligation and risk mitigation techniques for non-cleared OTC derivatives. Brexit webpage launched: All of ESMA's publications on Brexit can be found in one location with details of ESMA's role. ESMA will publish its second video tutorial on the European Single Electronic Format (ESEF) this month. In this edition ESMA's Anna Sciortino will give issuers a broad overview of the process of preparation of an inline XBRL report prepared following the ESEF requirements. Missed the first tutorial on key requirements of the ESEF? Catch up here.